We all get excited by those products that promise big changes, especially in the hair department, but sadly more often than not they just don't deliver. 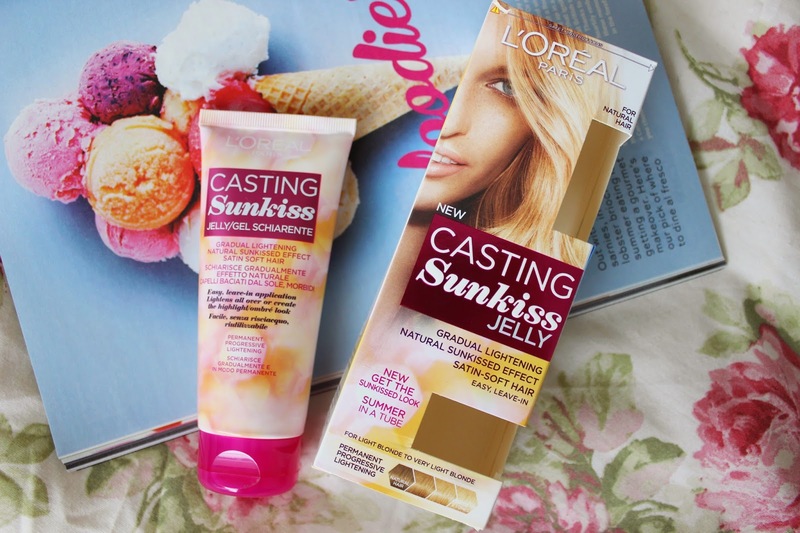 So when I heard about the new L'oreal Casting Sunkiss Jelly which gradually gives you sun kissed locks without the damage, I decided to hold back my excitement until I'd given it a proper go. My previous 'mousy to blonde at home' quests had resulted in orange hair with damage to boot, hence why I now go to the professionals. However, I'm pleased to report the lightening product we have here actually works and will give your hair a permanent refresh without the salon price tag! This miraculous jelly comes in three shade solutions so you can find the one that fits you. I went for the lightest offering and have been applying it to the ends of my hair to enhance the ombré, as well as a tiny bit through the top and midlengths for a summer sheen. Application is so simple as you literally pop a dollop in your hands and put it where you want to (Even I can't struggle with that). You can't make mistakes, don't need to wear gloves and can put it on wet or dry hair so it really is an incredibly easy product to work with. I chose to pop it on damp hair before blow drying because heat intensifies the results, hence why I also dabbled with the dry hair option whilst in Barcelona. Well, after patiently applying this for a few weeks my blonde ends have got blonder and I now have subtle honey toned streaks through my darker sections with no brassyness/unnatural shades in sight and I love it! Usually when lightening products actually work you can feel them in your hair and they also dry it out, but I haven't had either of these problems and my hair actually feels glossy and gorgeous! At just £6 a pop for a bottle that goes a long way this is a proper little gem and if you want all over highlights or fancy trialling the ombré trend, I would highly recommend. Have you given this 'summer in a tube' a go? I really got along with this too! It really helped to lighten my hair before dying it blonde, however a little warning to people who want to use it like me, hair dye doesn't apply very well after the use of this. Dye just doesn't take as well (if at all in some cases)! I'm really tempted to try this! I've never changed my haircolor before though, do you think it would work ok? This sounds lovely, and your hair is beautiful! I've been really curious about this, I think I'll get some :) thanks! was so tempted to try this out when it first hit stores. Sounds fab!